Stay tuned for our new 'Live in DC' at NRF Protect 2017 episodes - Coming Soon! "Experts in Lather Over 'gSOAP' Security Flaw"
Axis Communications - a maker of high-end security cameras whose devices can be found in many high-security areas - recently patched a dangerous coding flaw in virtually all of its products that an attacker could use to remotely seize control over or crash the devices. The problem wasn't specific to Axis, which seems to have reacted far more quickly than competitors to quash the bug. Rather, the vulnerability resides in open-source, third-party computer code that has been used in countless products and technologies (including a great many security cameras), meaning it may be some time before most vulnerable vendors ship out a fix - and even longer before users install it. At issue is a flaw in a bundle of reusable code (often called a "code library") known as gSOAP, a widely-used toolkit that software or device makers can use so that their creations can talk to the Internet (or "parse XML" for my geek readers). By some estimates, there are hundreds - if not thousands - of security camera types and other so-called "Internet of Things"(IoT) devices that rely upon the vulnerable gSOAP code. By exploiting the bug, an attacker could force the a vulnerable device to run malicious code, block the owner from viewing any video footage, or crash the system. Basically, lots of stuff you don't want your pricey security camera system to be doing. A Sinton woman seriously injured in a Walmart parking lot is about to receive a big pay day. 82-year-old Adelaide Price was hit by a truck driven by Joe Ray Cass in the parking lot in January 2014 and suffered multiple fractures to her skull and face, which required reconstructive surgery. She also suffered fractures to her ankle, pelvis, clavicle and elbow. Last Friday, a Nueces County Jury found Walmart to be negligent in the accident that left Price seriously injured. Walmart has been ordered to pay Price 43.6 million dollars. 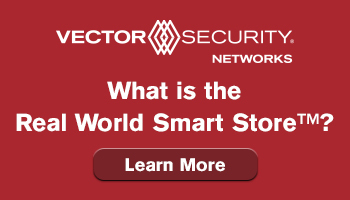 When Securitas acquired Diebold's North American electronic security business back in October 2015, experts predicted the move - along with the AlliedBarton-Universal Services merger - signaled the dawn of the "one-stop shop" era in the security industry, blurring the lines between traditional electronic security integration and protective services. 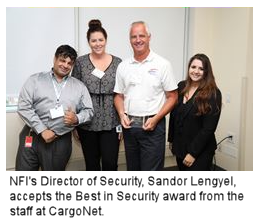 Leading supply chain solutions provider, NFI, has been awarded CargoNet's Best in Cargo Security Award in the Large Motor Carrier category for its cargo theft prevention efforts. The award was presented to NFI on June 30th at CargoNet's Supply Chain Cargo & Security Summit in Jersey City, N.J.
With a dedicated fleet of more than 2,200 tractors and 8,300 trailers across North America, customers trust NFI to move and store freight in a timely and secure manner. As the company continues to grow, NFI leverages partnerships, such as CargoNet, coupled with technology and an experienced security team to ensure that supply chains operate without delay. "There Is No Amount of Merchandise That's Worth Risking the Safety of Anyone in the Store"
Seventy-year-old veteran Jim Tinney was fired after he tried to prevent shoplifters from escaping with merchandise from a Home Depot outside of Houston. He acted on military instinct when he threw the paint roller stick he was carrying at their feet and attempted to run after one of the three men. It turns out his actions are against company policy. Despite trying to stop men running out with thousands of dollars in tools. Two weeks after a company review, he was told he lost his job. Home Depot's Director of Corporate Communications Stephen Holmes said via phone that the company policy is meant to protect the lives and wellbeing of both customers and store personnel. "There is no amount of merchandise that's worth risking the safety of anyone in the store," said Holmes. Home Depot has had numerous incidences of either customers or employees trying to impede shoplifters with extremely harmful or even fatal results. "Shoplifters have become extremely dangerous," said Holmes. He went on to talk about even very recent situations where employees were harmed when shoplifters retaliated by burning down store locations, punching employees until they sustained brain damage, and killing employees. 13 customers reported symptoms between July 14-15 - such as vomiting, diarrhea, severe stomach pain, dehydration, and nausea to the website iwaspoisoned.com, which first alerted Business Insider to the issues at the Sterling restaurant. One person reported two hospitalizations as a result of the illnesses. Chipotle told Business Insider that it is aware of the illnesses and has notified local health officials. The illnesses are isolated to the Sterling restaurant and that the company plans to reopen that location on Tuesday after sanitizing it. Norovirus is different from E. coli, the bacteria that led to a widespread outbreak at Chipotle restaurants in 14 states two years ago. The virus is highly contagious and causes symptoms like stomachaches, nausea, diarrhea, and vomiting. It's the most common cause of food-borne illnesses in the US with more than 21 million cases annually. The newest version of the Form I-9 was published by U.S. Citizenship and Immigration Services (USCIS) July 17. Current storage and retention rules have not changed. "The new version brings very subtle changes to the form's instructions and a list of acceptable documents, which were created with the theoretical goal of making the form easier to navigate," "Besides changing the wording on the form in almost imperceptible ways, the new version renumbers all List C documents except the Social Security card and streamlines the certification process for certain foreign nationals." The revisions to the form relate to USCIS's List of Acceptable Documents and specifically update List C to reflect the most current version of the certification or report of birth issued by the U.S. State Department. Employers completing the Form I-9 on a computer will be able to select the newly added Consular Report of Birth Abroad Form FS-240, which is issued to certain employees born overseas to a U.S. citizen parent. E-Verify users will also be able to select Form FS-240 when creating a case for an employee who has presented this document for employment eligibility verification. The new form will also modify the form's instructions by removing "the end of" from the phrase "the first day of employment" in reference to completing Section 1. "While the agency did not specify the reason for this change, it was likely made to ensure consistency with the regulations which indicate that Section 1 must be completed 'at the time of hire,' without any reference to the time of day," Fay said. "Following this updated guidance, employers may want to revisit their own I-9 policies and procedures to ensure that Section 1 is completed no later than when the employee starts work for pay." "Every change to the Form I-9, no matter how small or seemingly insignificant, can have an impact on an employer's ability to stay in compliance with the law." It's not unusual for publicly traded retailers to stop releasing monthly sales reports. Walmart ended the practice in 2009 and J.C. Penney did so in 2014. Home Depot, Kohl's, Macy's, Nordstrom, Target and TJX Cos, haven't reported monthly figures for years. H&M's rationale for ending the practice is that monthly updates do not provide an accurate picture of where the business is headed. Instead, like others before it, H&M's leadership maintains that quarterly and/or seasonal reports offer investors more accurate insights into its performance. The Swedish apparel retailer, which had not been reporting same-store numbers for some time, also promised greater transparency into its strategic initiatives and business results going forward. While H&M's decision is unlikely to make or break its relationship with investors, not everyone is thrilled with the decision. 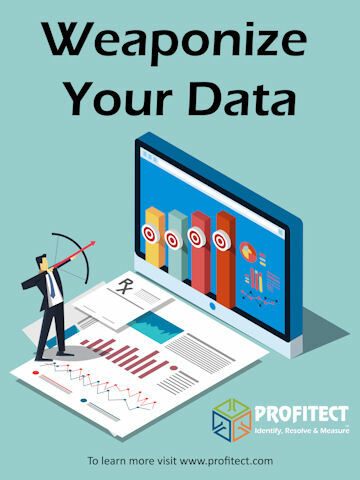 An unnamed fund manager told Reuters, "Monthly data was not a problem when the company performed well. Why should it be now?" One analyst said "It lets a company spend time talking about where it wants to go, rather than focusing on why this month wasn't comparable to the same month a year ago." Editor's Note: Walmart stopped reporting monthly sales during the heat of the Great Recession with most surmising they simply didn't want anyone, investor or consumer, to know how the recession was impacting them, which started the trend in virtually the entire retail industry. When we started the Daily in 2009, the monthly comp/sales list was lengthy and everyone watched out for the numbers to see how everyone else was doing, especially one's competitors. For decades retail executives lived by those numbers and used them to measure their own success or failure, and to a certain extent it was the academic thing to do and an industry standard. But the great recession made an impact and brought out a survival mentality that was all about crushing your competition and not letting them know anything about your business unless required to by law, which is what the quarterly reports satisfy. A Flu Pandemic Is Coming, But When, and How Bad Will It Be? One of the reasons authorities are currently worried about the possibility of a flu pandemic is the increasing amount of interaction between human flus and bird flus. Businesses should identify the essential functions of their business and assess how they might be affected if large numbers of employees were sick or had to take care of family members. Businesses need to be able to communicate not only with employees and customers, but also with suppliers. "If there is a flu epidemic in your state and your employees are getting sick, what would you do on Day 1?" Teel said. "Do you know who to contact, and what the best method is to communicate your situation to customers, employees and vendors?" Policy adjustments. Businesses may want to increase sick leave or make telecommuting possible for more employees to keep people who are sick from coming to work. They may also want to change the frequency or type of meetings to minimize face-to-face contact among employees. Twitter tributes have flooded in for a state of the art security robot that plunged wheel-over-nosecone into a shallow fountain near Washington D.C. - and couldn't get back up. The National Coalition of Law Enforcement and Retail has announced the agenda for their 8th Annual Training Conference scheduled for October 16-19 in San Antonio, Texas. The agenda and overall focus of the conference is to address the top national issues and priorities put forth by the senior leadership in both arenas. Specifically, the sessions will center around thee topics; Violent Crime, ORC Investigations and Business Continuity. The conference has called upon the leading experts from both the public and private sectors to offer the most current and relative information to benefit both the atendees and the organizations they represent. 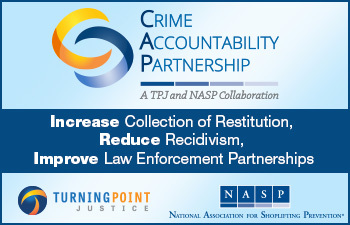 Including two bonus sessions on "Participatory Leadership and Partnership" from two sitting Chiefs of Police. Become a PCIP - PCI Professional - Excellence in Payment Security, Monday, Sept. 11 - Orlando, FL. What Would You Do in a Food Safety Crisis? 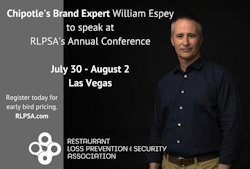 The Restaurant Loss Prevention & Security Association (RLPSA) is excited to add Chipotle's Branding Creative Lead, William Espey, as a keynote speaker to its food and restaurant-specific agenda for the 38th Annual RLPSA Conference & Expo in Las Vegas, July 30 - August 2, 2017. Espey will share crisis management essentials as he reflects on vital lessons on brand loyalty from the recent Chipotle crisis. 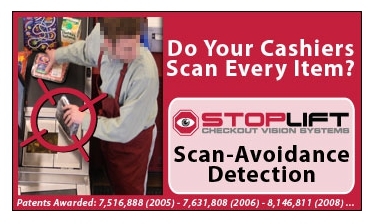 When StopLift detected its 2 millionth incident of scan avoidance at a Piggly Wiggly, the supermarket's owner knew that cashiers were either stealing or failing to scan items, costing his supermarkets major losses. Chris Ajlouny, owner of 11 Piggly Wiggly supermarkets in the Birmingham, AL area, did not tell any employees at his stores when he installed StopLift, so that he could see the extent of scan avoidance. In the first week, he saw three cashiers steal $400-$500 at a time, sliding groceries around the scanner and later getting "kickbacks" from the customer. One cashier admitted to getting kickbacks outside the store and was fired. "I'm amazed that we were the 2 millionth incident," Ajlouny said. "The system has accomplished a lot. As long as we keep stopping these people, it's excellent. I wouldn't open a store without having StopLift installed." 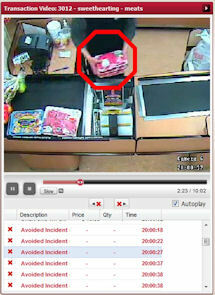 Now he shows new employees videos of scan avoidance from his "smart cameras" to deter them from both stealing and negligence at the checkout. Theft has also been deterred in the supermarkets' receiving areas. "My cashiers know they are being watched," Ajlouny said. "They see their performance on video. StopLift keeps an honest person honest and makes a dishonest person honest." 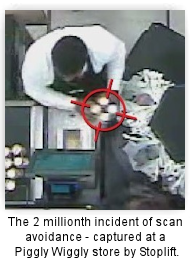 Yet, the new Piggly Wiggly employee whom StopLift's Scan-It-All video analytics technology caught stealing in its 2 millionth scan avoidance incident thought he could outsmart the smart cameras. Ajlouny immediately fired him. StopLift Checkout Vision Systems has detected and confirmed more than 2 million incidents of scan avoidance at both manned and self-checkouts at supermarkets and retailers in the U.S. and around the world. Incidents include "sweethearting", when cashiers pretend to scan merchandise but deliberately bypass the scanner, thus not charging the customer for the merchandise. The customer is often a friend, family member or fellow employee working in tandem with the cashier. "Staff-less stores will bring the "next spring" to the retail industry"
The online group has joined other retail chains and tech startups flocking into the market with their own solutions, making staff-less retail one of the hottest tech trends. Tao Cafe opened for a trial run on July 8. In the footsteps of the Amazon Go store that made a big debut last year with its use of tracking cameras, it utilizes a facial and voice recognition system. Purchases are tracked by a facial recognition camera, and the system automatically generates bills as soon as customers walk out of the specially designed gate that can identify them with biological sensing technology. Kicking it off before Alibaba, Guangdong-based tech startup BingoBox started to spread its version of staff-less stores. Unlike Tao Cafe, Bingobox is more of a hybrid between convenience stores and vending machines, where customers can walk in and pay by scanning QR codes on their phone. This bypasses eye contact and small talk that normally take place with cashiers in traditional stores. "By the end of August, we are expecting to open 200 more Bingobox stores," said Chen Zilin, CEO of Bingobox. "We only cost a quarter of a traditional convenience store, and running costs are one-eighth." "Staff-less stores are a combination of digital payments, radio frequency identification technology, biological recognition, big data and AI," Wang said. "They will lower the risk of shop lifting, optimize the goods and reduce costs, from running and maintenance costs to human labor." "In 2017, staff-less stores will boom," Chen added. The "Curse of the Ex-Employees"
Former employees increase the security risk for organizations failing to de-provision their corporate application accounts. Nearly half of businesses say former employees are still able to access corporate accounts, a new study found. Ex-employees pose a big security risk: Twenty percent of businesses have experienced data breaches by former staff, according to OneLogin's new "Curse of the Ex-Employees" report. Of those, nearly half claim that more than 10% of all data breaches are the direct result of former workers. Half say ex-employees' accounts remain active for longer than a day after they leave the company; 20% take a month or more to deprovision employees after they leave. IoT toys are more than fun and games and can potentially lead to a violation of children's privacy and safety, the Federal Bureau of Investigation warned Monday. Internet-connected toys carry the potential of violating children's privacy and safety, given the amount of information the toys can collect and store, the Federal Bureau of Investigation warned on Monday. The Risk Management team is responsible for establishing and maintaining the Corporate Security risk management program at Mastercard. The program is intended to ensure the company's information assets and systems are managed in accordance with corporate security policies and standards, providing adequate protection of the environment. The risk manager is the "process owner" for all security related risk assessments as well as the identification and tracking of discrete risks and policy exceptions. Bob Dale, SVP Sales for Protection 1, and Rex Gillette, VP National Accounts Retail, talk about Protection 1's immense growth in the retail security market, since entering the segment four years ago. With a customer-focused culture, Protection 1 is redefining the installation world with its highly successful SEAL Team conversion process. Hear from Bob and Rex about the company's unique eSuite platform and get an exclusive scoop on what Protection 1 will be bringing to the market next. On Monday, Walmart faced a barrage of criticism as shoppers noticed that a wig cap sold by a third party seller on its marketplace used a racial slur to describe the item's brown color, according to several news reports, including USA Today, and a social media storm. Walmart said: "We are very sorry and appalled that this third party seller listed their item with the description on our online marketplace. It is a clear violation of our policy and has been removed, and we are investigating the seller to determine how this could have happened." And it was counterfeit: The maker of the wig caps, U.K.-based Jagazi Naturals, posted a banner saying that neither the listing nor even the item had anything to do with them. "The real JAGAZI is a 100% black company for black people. People have often used our brand name to try and sell their products." Marketplace popularity is on the rise - among consumers and retailers - but clearly poses some risks. Customers don't disconnect a merchant's brand from their experience with third-party sellers on your marketplace - problems with marketplace orders bubble up to the marketplace owner. Paytm Mall has revamped its seller onboarding process. To this end, the ecommerce platform has delisted over 85K online sellers. As per the new changes in seller onboarding process, the company will only look to partner with reputed shopkeepers and brands. The company has made it mandatory for online sellers to furnish brand authorisation letters. It will bring their catalogues online, enabling a smoother discovery and buying experience for their products. The company will also provide the shops with Paytm Mall QR Code solution. Amit Sinha, Chief Operating Officer - Paytm Mall said, "Our goal is to set the benchmark for a platform that empowers reputed local shopkeepers and brands to sell quality merchandise. We will work closely with existing sellers and continue onboarding further. This will help us offer a superior consumer experience." ORC - Evolved: "Illuminating the Dark Side"
Mark your calendars! The California Organized Retail Crimes Association is hosting its annual training conference in San Diego on Sept. 28 and 29. The event is open to private security, law enforcement and loss prevention industry professionals only. For more information about this event, download the flyer. Richard Aviles named Asset Protection Manager for Louis Vuitton. • Strengthen and develop a strong safety culture in the company with the goal of all employees recognizing their role in "everyone going home safe." Success cannot happen without conflict. Because success always challenges the status quo, regardless, and mandates change. And in order for change to be successful you need commitment - you need everyone to buy in totally. It's not good enough for everyone to merely agree and move forward because they'll be those that merely go thru the motions and don't believe. One can disagree and still commit but for those who don't engage - commitment is a mere phrase not reinforced by actions. Please make sure to add d-ddaily@downing-downing.com to your contact list, address book, trusted sender list, and/or company whitelist to ensure you receive our newsletter.